African Americans’ efforts to secure political equality were impacted by necessary coalitions with whites. Because of the tenuous nature of these relationships, political scientists have explored what seems a natural development: coalitions among blacks and Latinos. Much of the research on the potential for this coalition development has reported prevalent feelings of distrust and hostility. 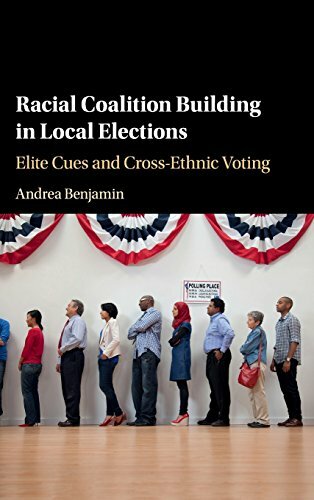 Andrea Benjamin's Racial Coalition Building in Local Elections: Elite Cues and Cross-Ethnic Voting expands this discussion by focusing on black and Latino vote choices in mayoral elections. Benjamin proposes the “co-ethnic elite cues theory,” which argues that when partisan cues are absent and race/ethnicity is salient in an election, co-ethnic endorsements should prompt minority groups members to vote for a particular candidate, even if that candidate is from another ethnic group (p. 8). According to this theory, there are “three factors that explain possible variations in Black and Latino voting patterns in local elections: elites and their endorsements; the quality and demographic characteristics of the candidates; and the political context (racial/ethnic salience)” (p. 37).